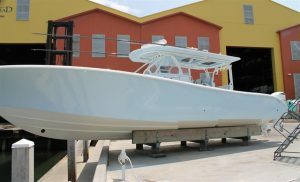 Check out this used 42' Yellowfin boat for sale in Florida! : Atlantic Yacht & Ship, Inc. Check out this used 42′ Yellowfin boat for sale in Florida! Word just came from Chris Carroll that he has listed a great deal on an used 42′ Yellowfin for sale! In the first place, this used 42′ Yellowfin boat for sale was launched in 2015. Moreover, this used 42′ Yellowfin was custom built by a very knowledgeable yachtsman. After all, she is loaded with double-row helm seating, side dive door, and bow thruster. Also, she has full Simrad electronics, KVH satellite TV, and an upgraded diamond stitch interior. In fact, with an Eskimo ice maker, air conditioning, and outriggers, the list goes on and on! In short, you simply will not find a nicer used 42′ Yellowfin around. She has always been kept inside, out of the water, and is not bottom painted. Yellowfin boats are known for being the premier center console fishing boat. Their quality is unsurpassed. Each model is designed specifically to exceed the expectations of the owner. This includes handling on the water and running fast for big game. For more information on this used 42′ Yellowfin for sale in Florida be sure to contact Chris Carroll today! Check out this Stuart Boat Show Yellowfin boat for sale! Check out this 42′ Yellowfin center console for sale! Check out this awesome 36′ Yellowfin for sale in Florida!